Enjoy Bavarian Breads Organic Pumpernickel Bread. 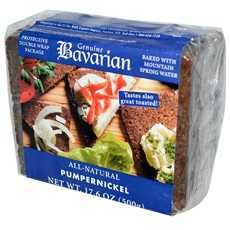 Bavarian Organic Pumpernickel Bread Is Naturally Sweet And Dense, Leavened The Old World Way. (Note: Description is informational only. Please refer to ingredients label on product prior to use and address any health questions to your Health Professional prior to use.